I am two books through this trilogy and am dying to get my hands on the third. They are fast-paced, edge-of-your-seat interesting. I actually waited until all three books were published and I am so glad I did because I have no idea how I'd handle it if I couldn't fly through (heh heh . . .more puns) all of them. 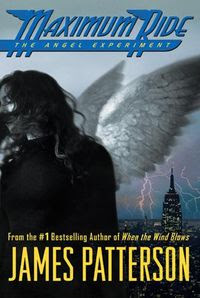 Maximum Ride and 5 other mutant freak bird kids (their way of describing themselves, not mine) escaped from "The School" a scary place where they were bred and raised as animals in dog crates with all sorts of scary experiments done on them. Fortunately, we only find out about those things through flash backs - most of the first two books is about them on the lam, running and flying away from the Erasers (mutant freak wolf kids) who are trying to re-capture them for The School. Although the basis of this book is sketchy genetic engineering, it is some good old-fashioned good guys against bad adventure and escape writing. With two books down and one still to go, I am unabashedly recommending this series. Apparently, there's a movie coming someday.